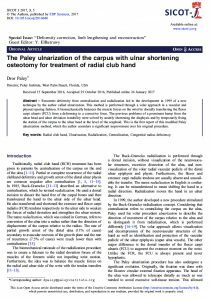 Radial Club Hand is an aesthetically unappealing deformity that also results in significant functional impairment (due to absent or hypoplastic thumb) and instability and restricted motion in the elbow, wrist, and finger joints. Parents of children with RCH seek treatment for the condition shortly after birth. The deformity of the radius in RCH results in the ulna becoming the primary forearm bone. Due to this, there is little or no support for the carpus (wrist joint) on the radial side; furthermore, the carpus may be displaced off the ulna altogether. As the wrist and fingers are flexed, the flexion force results in radial deviation of the hand and volar displacement of the carpus (toward the palm side). Individuals with RCH have poor grip strength due to the lack of a fulcrum and the forearm shortening resulting in shortened muscles. To easily understand this, try flexing your wrist downwards, palm side down, and then try and make a fist. You will find it is much more difficult to make a fist then it is with your wrist in a neutral position. Although children who have RCH (especially unilaterally) adapt adequately to this anomalous condition, obvious functional deficits occur that limit activities. Motion of the elbow joint might be decreased, or the joint might be fixed in extension. Motion of the wrist and fingers is limited, with the deficit being most severe in the index finger and progressively less severe in the other fingers. Patients with RCH often have absent or hypoplastic thumbs. They often develop a side-to-side pinch between adjacent fingers that is useful for handling small objects but is ineffective for grasping large objects. Decreased forearm length reduces the patient’s reach. Activities involving the use of two hands are difficult to perform when a normal hand must be brought to meet a shorter extremity. When both extremities are involved, activities are greatly impaired by the absence of at least one upper extremity of normal length. For these reasons, surgical treatment for RCH is frequently requested. At the Paley Institute we treat RCH with the Ulnarization surgery, a technique modified by Dr. Paley from an earlier surgery called a Radialization. With the Ulnarization surgery we can safely correct Radial Club Hand with no recurrence and low risk of complication, restoring function and cosmetic appearance to the patient.